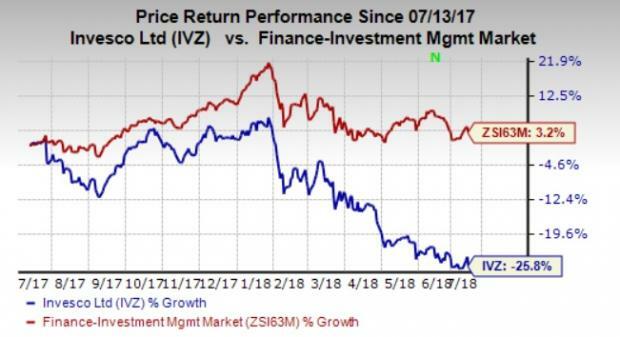 Invesco Ltd. IVZ reported preliminary month-end assets under management (AUM) of $963.3 billion for June 2018. The figure reflects a decrease of 1.4% from the prior month. This fall has been mainly due to unfavorable market returns, decrease in money market AUM, net long-term outflows and non-management fee earning AUM outflows. Moreover, FX decreased June AUM by $2.2 billion. Invesco’s preliminary average total AUM for the quarter through Jun 30 was $973.9 billion while preliminary average active AUM came in at $734.9 billion. At the end of the reported month, Invesco’s Equity AUM declined 1.1% from the previous month to $446.9 billion. Further, Fixed Income AUM of $232.7 billion decreased 1.4% from the May 2018 level. Moreover, Money Market AUM was $80.4 billion, down 2.9% from the last month. Additionally, Balanced AUM of $57.4 billion declined 1.9% from the prior month. Alternatives AUM decreased 1.4% from the last month to $147.9 billion. While the company has been witnessing continued growth in AUM for the past few years, supporting revenue growth, an overall challenging operating environment seems to be weighing on investors’ mind, at present. Invesco currently carries a Zacks Rank #4 (Sell). In the past year, shares of the company have lost 25.8% against the industry’s rally of 3.2%. Apart from Invesco, Franklin Resources, Inc. BEN reported preliminary AUM of $724.1 billion by its subsidiaries for June 2018, reflecting 1.2% increase from the prior month. Further, Legg Mason, Inc. LM and T. Rowe Price Group, Inc. TROW are expected to announce their AUM figures soon.